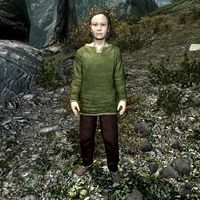 Bottar is a Nord child who can be encountered randomly out in the wilds. He wears green colored child's clothes and a pair of shoes. His friend Sond will sell you a waypoint to a location for one septim. This page was last modified on 11 December 2013, at 23:14.